When we began researching our family history 40 years ago, we fairly soon discovered that there were Growden families in Lancashire. I wrote to a Joseph Growden in Bolton, Lancashire, and he said trhere was a family tradition that the family had originated in Cornwall, but when they cjecked it out, the earliest member of the family they knew of turned out to have been born in Rishton, Lancashire. Now many more records are more easily available, and I’ve been able to piece together something of the story. Joseph Growden, a blacksmith, was born in Bodmin in 1830. He married Mary Ann Knight of Roche in 1855 and worked in various places in Cornwall. In the 1871 Census they were at Kea, where their younger children were born, and in 1875 their daughter Catherine died there, aged about 14. In 1877 the eldest son, Thomas, married a local girl, and within the next couple of years the family moved to Caterall in Lancashire, where they seem to have stayed, with the exception of Thomas, who returned to Cornwall. Some lived at Rishton, and others at Radcliffe. This Joseph Growden was my 1st cousin three times removed — in other words, he was the first cousin of my great grandfather William Matthew Growden, though being the son of an older brother, he was some 20 years older. That generation of Growdens seem to have got wanderlust, because in the late 1870s they scattered from Cornwall in different directions. My great grandfather came south to the Cape Colony, and his cousin Joseph went north to Lancashire. Another cousin, James Growden, had gone west to Canada some ten years earlier, and yet another cousin, Henry Growden, ended up in New Zealand, with some of his descendants living in the USA, in places as far apart as New Orleans and Alaska. So in that period, 1850 to 1880, Cornwall seems to have acted as a giant centrifuge, spitting out Growdens in all directions. But back to the Lancashire ones. In the course of searching for members of this family I came across a marvellous web site devoted to Rishton in Lancashire, which I still haven’t fully explored yet. It has a full page devoted to the military service and medals of George Growden, son of Joseph (1863-1928), who served in the first World War. It is well worth looking at if you have any ancestors who lived in or around Rishton. A lot of the Lancashire Growdens seem to have had son’s called George, which makes it a bit difficult to work out which ones married which spouses, but at any rate, there are now probably more Growdens in Lancashire than there are in Cornwall. From their ages at the census I was able to find, on FreeBMD, their appoximate dates of birth, and possible dates of marriage and death. All except for Robert M. who seemed to have disappeared from the face of the earth, and there was no record of his birth. Suspecting a transcription error, I checked the original of the 1881 census, and there he was, not Robert M. but Herbert W. And from there it was possible to track him in other records. He was Herbert Wilson Bagot (1870-1927). He was born in Barrow in Furness. At the age of 20 he was in Govan, Scotland, as an electrical engineer. A few years later he made at least one voyage to Australia as a ship’s electrician. He married Isabella Christina Davidson of Aberdeen at Chorlton in Lancashire in 1898 (why at the opposite end of the county to where his parents lived is not clear), and by the 1901 census he was in Aberdeen as an electrical engineer. He died in Glasgow in 1929, and may have had a son, Walter Fraser Bagot, who was a medical student. See more on the Bagot family forum. 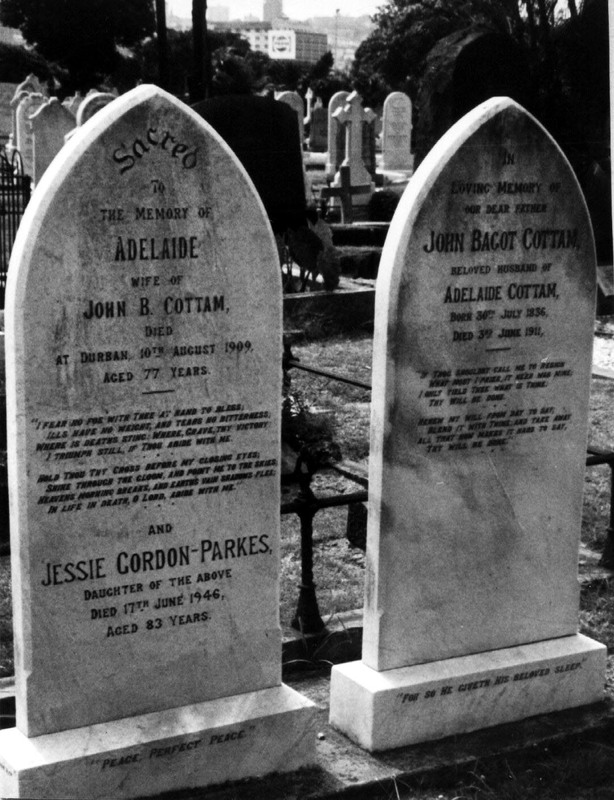 John Bagot Cottam was born in Salford in 1836, the son of Richard Cottam and Margaret Bagot. He grew up in Manchester, where he was a warehouseman. 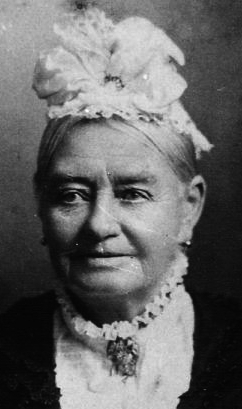 Her married Adelaide Herbert, daughter of Reuben and Ellen Herbert, in 1858, and their first three children, Margaret, Ada and Jessie were born in Manchester. He came to Natal in 1863 as accountant to the Natal Cotton Plantation Company. The American Civil War had disrupted the supply of cotton to the Manchester cotton mills, and it was thought that Natal might be an alternative source of supply. That soon fell through, however, and in 1867 J.B. Cottam set up business on his own account as a wool presser and fresh produce dealer. When the Durban fresh produce market was opened in 1876, he became the first market master. In 1891 he became a city councillor. For two terms he served as a town councillor of Durban until he retired in 1894. He then started his own business as accountant and auditor at 61 Esplanade Buildings. Benevolent Society for several years and occupied the position of secretary to the Seamens Institute. He took an active interest in church affairs, and was one of those who supported the Colenso schism from the Anglican Church in Natal, and was at one time publicly rebuked to be Bishop of Natal for preaching without a licence from the bishop. They had five more children in Natal: Richard Herbert, Lucy, Bessie, Lily and Kate. 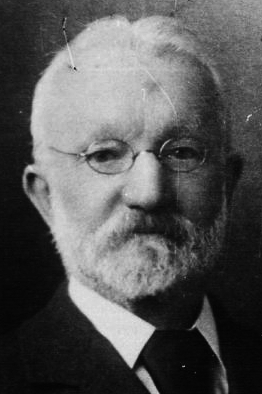 John Bagot Cottam’s younger brother, William Henry Cottam, also came to Natal, and farmed near Verulam. Today I followed the story of someone in my family tree, which struck me as rather sad. She wasn’t a direct ancestor, she was my second coursin three times removed, and the story is just a bare outline, gained from the birth, mattiage and death indexes and census records for Lancashire. She was the eldest daughter of John Cottam of Heaton in Lancashire, and Nancy Kellet of the nearby parish of Heysham. According to the 1871 census, Susanna Cottam was 3 years old, and her younger brother Adam was 1. Her father John was a farmer of 102 acres at Forton in the parish of Garstang. In the 1881 census the family was still at Forton, Susanna was 13 and listed as a scholar, and her brother Adam was 10, and there were several younger brothers and sisters: Margaret, Ann, Robert and Elizabeth Alice. In the 1891 census she was no longer with the family, but I could find no trace of her in the census staying anywhere else. She would have been 23 years old, so perhaps she had left home and got married, and was living under another name. The rest of the family had moved to Nether Wyresdale, and there were no farm servants — perhaps the older sons provided the labour on the farm, or perhaps they lived out, and came in to work; at any rate he is listed as an employer. John Cottam’s widowed mother-in-law Margaret Kellet was also staying with them, living on her own means. In 1901 the family had moved to Preston, and they appeared to have come down in the world. John Cottam was a farm labourer (cattle), working for someone else, as were the older sons. The mother-in-law had gone, probably died. There was another daughter, Nancy, aged 7. And the oldest daughter was back, aged 33, and a cotton weaver. She was listed as Susanna Kellett, rather than Cottam. And there were two grandchildren: Edith Kellett, aged 9, and Florence Kellett, aged 5, clearly Susanna’s daughters born out of wedlock. Why was she now listed as Kellett rather than Cottam? Was she an illegitimate daughter John Cottam’s wife had had before they were married, and now that she had illegitimate daughters of her own, was her father distancing himself from her by listing her under her mother’s maiden name? Jphn Cottam and Nancy Kellet seem to have married soon after Susanna’s birth, and almost immediately after they were married went to live at Forton in the parish of Garstang, where most of the other children were born. She was listed as Susannah Cottam on the next two censuses, perhaps because no one there knew them. So I wondered what eventually happened to Susanna. Did she marry, either the father of her daughters or someone else, and live happily ever after? Apparently not. According to the death register she died in about August 1907, at the age of 38. She was listed as Susannah Cottam Kellett. Her elder daughter would have been 15, ans the younger about 10 or 11. I wonder what happened to them. Did their grand parents continue to care for them, or uncles and aunts? And from the bare outline, Susanna seems to have had rather a hard life. There have been lots of single parents beofre and since, including others in my own family. But her story left me feeling a bit sad for her. John Bagot Cottam, my great great grandfather, came to Natal in 1863 with his wife Adelaide Herbert and three children. Several more children were born in Durban. 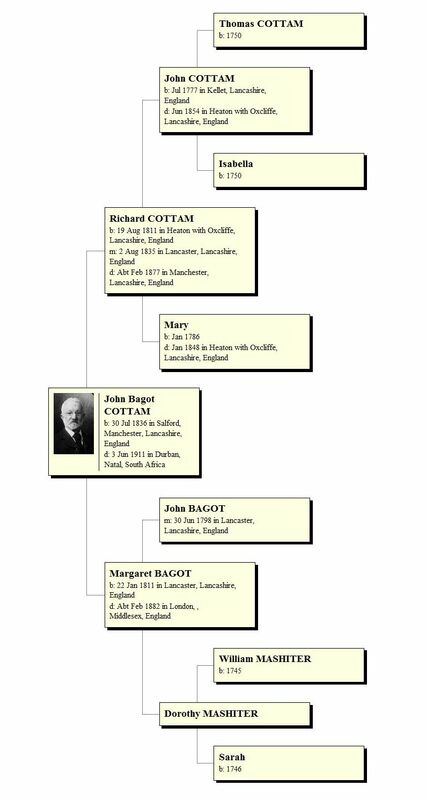 We knew that his parents were Richard Cottam and Margaret Bagot, but only in the last few months did we find out who their parents and grandparents were, so here they are. And we’re already beginning to discover new (well hitherto unsuspected) cousins, and we hope that anyone else related to this femily will get in touch. When we first started researching our family history 35 years ago, we made rapid progress. Every couple of months we discovered an earlier generation on one or other branch of the family. But then we got stuck. And so it was with the Cottam family. But now we have discovered two new generations going backin as many months. First was my great great great grandfather Richard Cottam — I discovered his parents, John and Mary Cottam, of Oxcliffe Hall in the village of Heaton with Oxcliffe near Lancaster, as described here. Unfortunately Henry decided to annoy future generations of the family by inconsiderately dying in 1848, before the 1851 census, so it isn’t possible to confirm this, but it seems likely. Then yesterday I went to the Mormon family history library in Johannesburg and looked at the films for Overton, and especially for the period 1800-1812, looking for the baptism of an Isabella Cottam. I had one who had died young — born in 1809, daughter of Henry and Alice Cottam, and she died in 1818 at the age of 9. But there was another one who married a John Bagot, who was a brother of the Margaret Bagot who married Richard Cottam, my ggg grandfather. There were two films, one the actual register of St Helen’s, Overton, and the other a copy that was sent to St Mary’s, Lancaster, of which St Helen’s was a chapelry, so I compared both. The copy had an Elizabeth Cottam at about the right period , daughter of John and Margaret Cottam, coming immediately after an Isabella Mashiter. I checked the original and found that it was what I was looking for — Isabella Cottam, daughter of John and Mary, only it was very faint, so I had missed it the first time. So a Cottam brother and sister had married a Bagot brother and sister. So two Cottam family mysteries were solved on the same day. Of course it also produces more mysteries. Just as Cottam families suddenly appeared in Heaton-with-Oxcliffe towards the end of the 18th century — and we now know they came from Kellet — so they suddenly appeard in the parish of Bolton-le-Sands in the middle of the 18th century, and apparently came from somewhere else. That’s the thing about family history. You never finish. For the last few weeks I’ve been concentrating my genealogy research on my Cottam, Bagot, Mashiter and related surnames in and around Lancaster in Lancashire, so I thought I would mention them today for Surname Saturday. My great great grandfather John Bagot Cottam married Adelaide Herbert in Manchester in 1858, and in 1863 they emigrated to Durban with their three daughters, Maggie, Ada and Jessie. In Durban they had another five children. John Bagot Cottam was the son of Richard Cottam and Margaret Bagot, who came from around Lancaster, in the north of Lancashire. I’ve been going through the microfilms of parish registers to try to find their origins, together with the registers that have been transcribed by the Lancashire Online Parish Clerks. I note each instance of records of the surnames of interest in a database, whether known to be related or not, and then try to connect them into families with the help of census records. FreeCEN has relatively complete records for the 1861 census, and FamilySearch has for the 1881 census. This also helps to get the names into families, which I keep in a lineage-linked database in the Personal Ancestral File (PAF) program, which is free. I have a separate database for Lancashire research, and throw everything in, whether the people are related or not. When I think there is enough evidence of a confirmed relationship, then I transfer them to my main database in Legacy. The Cottam surname goes back to the mid-18th century in Heaton-with-Oxcliffe, just west of Lancaster, but before that they seem to have come from somewhere else. The Mashiter surname goes back a bit further. Heaton-with-Oxcliffe was in the parish of Overton, but Lancaster was almost as close as Overton, so some members of the families were baptised, married or buried there. Using Lancaster as the centre, I am working outwards and checking other parishes to see if I can find where the Cottams came from. Lord, Barnet, Parker, Atkinson, Richards, Monks. Variant spellings include Cotham, Cottom, Bagott, Baggot, Baggott and Masheter. Some of the related places mentioned in the register and census entries are Poulton-le-Sands and Bare (now Morecambe), Heysham, Sunderland, Scotforth, Ellel, and Skerton.